Blazing Saddles: Rock around the clock at Khao Sok! We reached Khao Sok National Park on a rain-sodden green season day after heading north across the Sarasin Bridge, then up coastal Highway 4 to Takuapa, then east on the 401 across the Isthmus of Kra towards Surat Thani. 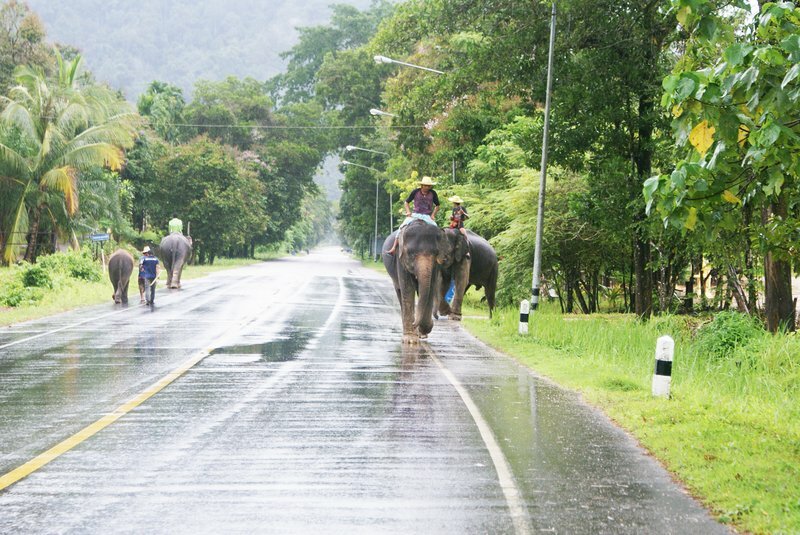 Baz hurtles along the road in Khao Sok. 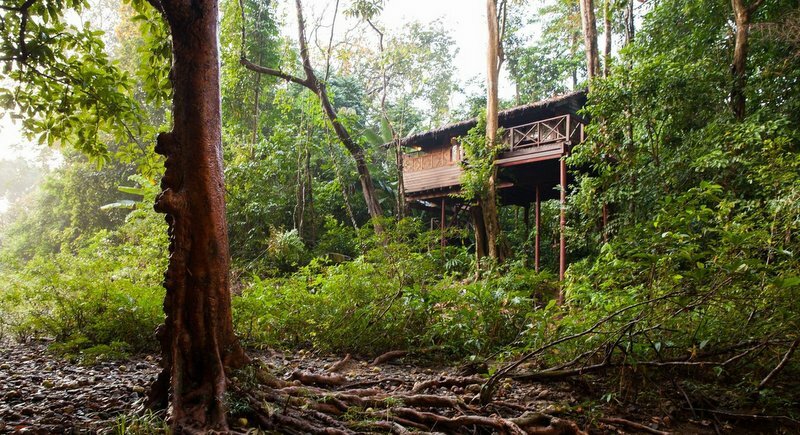 A guesthouse bungalow nestled in the blanket of jungle. Enter the lush tropical jungle and swim in cooling steams. You might have to share the road with elephants. 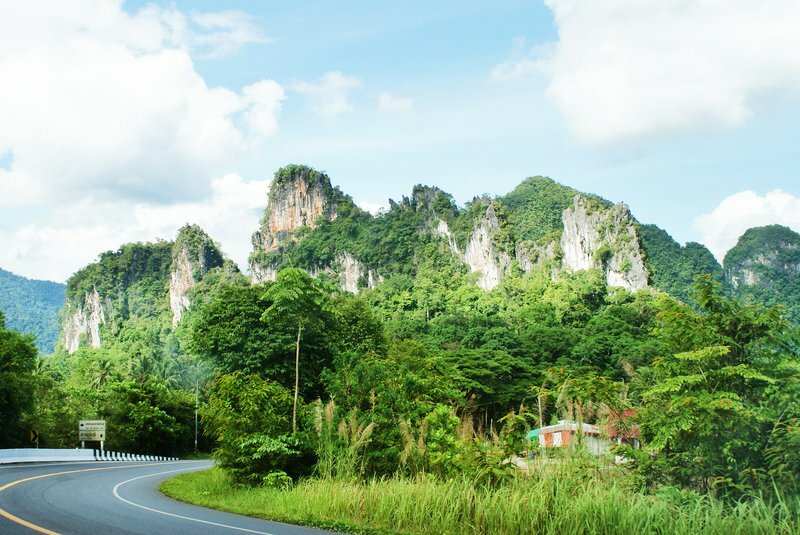 The drive to Khao Sok features stunning roadside scenery. 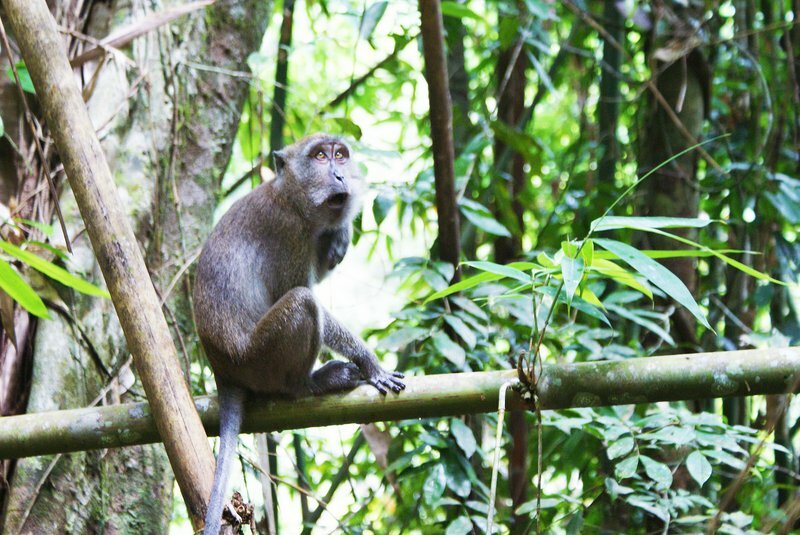 A macaque searches for food amidst dense bamboo thickets in Khao Sok National Park. It took about three hours, with our mountain bikes roped to the bed of our pickup. As we approached the park, it was like awakening in another, far more peaceful, universe. You know you are in for something special when the scenery along the route becomes at first dramatic, and then simply breath-taking, with huge limestone cliffs rising sheer from the verdant rain forest and towering majestically skywards… serrated giant’s teeth, festooned with vegetation, jaggedly etched against the lowering clouds. These are the remnants of the same 250 million year old coral reef that marches through Sarawak, Phang Nga Bay and eventually emerges in Halong Bay in the north of Vietnam. The Earth’s tectonic plate collision extruded this coral ever-higher over the eons and indeed continues to do so, albeit at a mere centimetre or two a year nowadays. 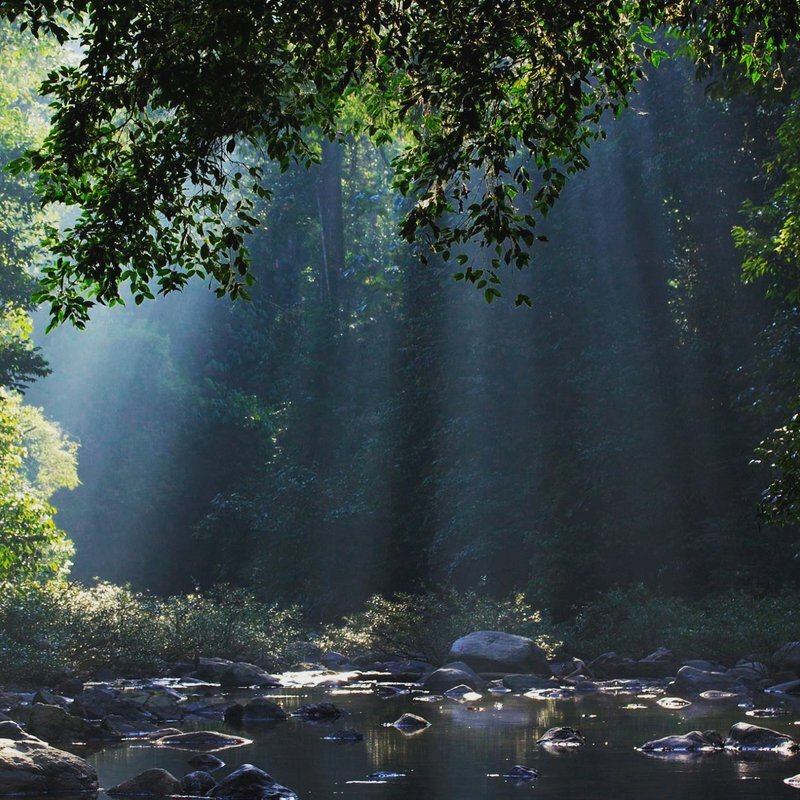 A well-marked left turn off Highway 401 takes you onto the little road to one of the world’s oldest and most pristine natural rain forests – Khao Sok National Park. 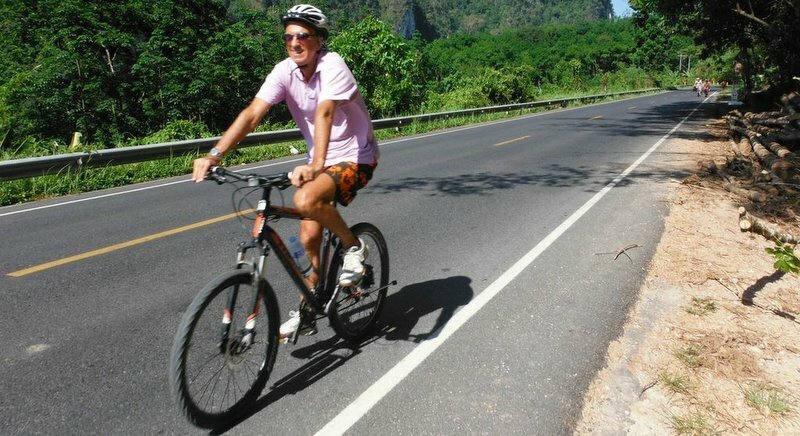 Khao Sok, and a few last remaining places like it in Southeast Asia, represent what renowned environmentalist Thom Henley termed “the geography of hope for plant and animal diversity and most importantly, for the human spirit”. Thom’s poetically-titled book Waterfalls and Gibbon Calls is the Bible on Khao Sok and is well worth reading if you venture to these parts. It was here that our cycling adventure really began. Dropping our gear in one of the lovely riverside wooden cottages at Our Jungle House Resort (www.khaosokaccomodation.com), we then cycled to the park entrance, paid B300 for a (Thai nationals pay B40) day ticket and we were on our way. We pedaled past the Visitor Centre and across the bridge over the Sok River and followed the left hand fork as it climbed a steep hill into the body of indigenous rain forest. This is most definitely mountain biking territory and the trail abounds in steep, often rocky, climbs and descents. It’s somewhat technically challenging with some rock jumping and sand surfing, and you also have to bear in mind that you share this path with a bipedal tribal ape known as Homo sapiens, not to mention sundry elephant, tiger, leopard, gibbons, barking deer, Malay sun bears and pangolins. This is not exactly your common-or-garden Phuket ride to the local Tesco! We rode the seven kilometre out-and-back trail, with a cooling splash in the deep pool at the turning point to revive our jellied legs. Sweat poured, gibbons hooted and occasionally hikers cheered us on. It was exhilarating and exhausting in equal measure, but extremely gratifying by ride’s end. We had supper back at the lovely Our Jungle House Resort, which has gained international fame as the best place to stay near to Khao Sok National Park and boasts a global travelling clientele that reflects this fame. 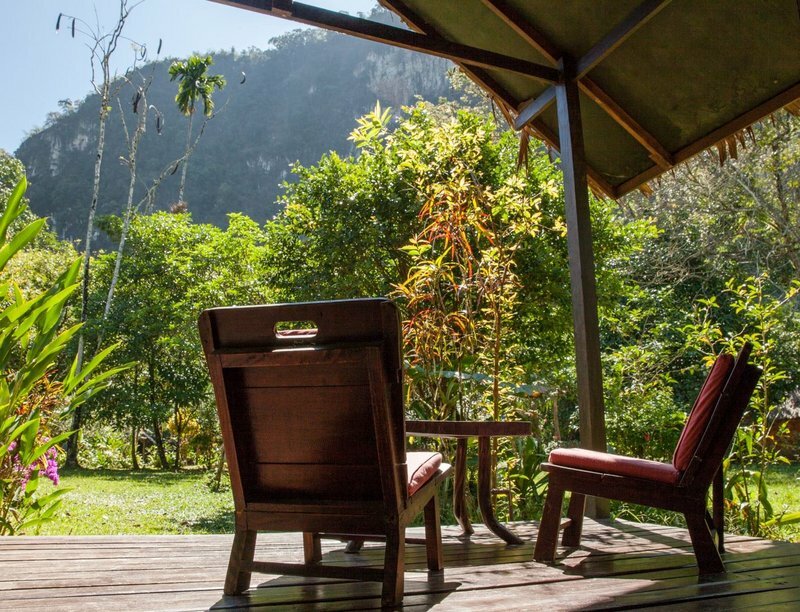 The wood-built cottages and tree houses are all beautifully integrated into the rain forest itself and bring you close up and personal with nature in this amazing location on the bank of the Sok River, with the huge limestone cliffs vaulting hundreds of metres above the resort. The resort’s Thai cuisine was excellent and the sociable environment conducive to the consumption of many cold ones after a satisfying day’s ride, and on this score I believe we acquitted ourselves with honour! We did indeed rock around the clock at Khao Sok!